By Mike Smith: After a brief break from fighting at the T-Mobile Arena in Las Vegas, Nevada for his last bout against Rocky Fielding, WBA/WBC middleweight champion Saul Canelo Alvarez (51-1-2, 35 KOs) will be back at that venue for his important unification fight against IBF champion Daniel Jacobs (35-2, 29 KOs) on Cinco de Mayo May 4 on DAZN. This is certainly a quality fight that Golden Boy Promotions and Matchroom Boxing USA are delivering to the fans and to DAZN. Jacobs is a huge step up in class from Canelo’s last opponent Rocky Fielding. 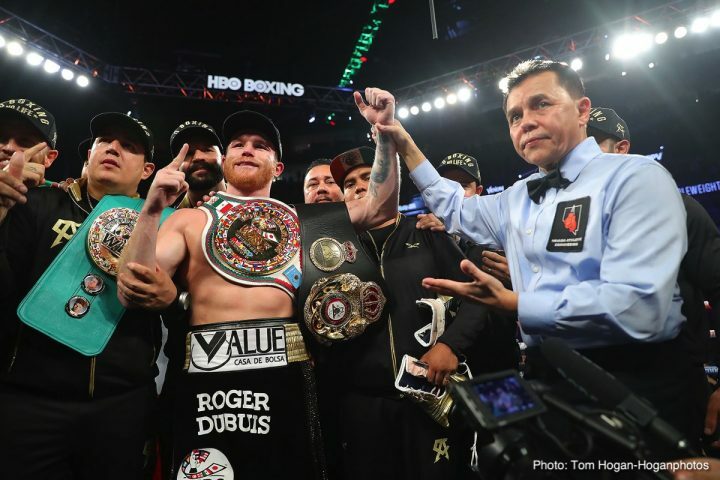 As long as the judging is up to par and makes sense to the fans that watch the Canelo-Jacobs fight at home LIVE on DAZN at ringside at the T-Mobile, then there should be a lot of happy people on May 4. It would be good for Canelo, as well as his promoters at Golden Boy, if the scoring for the Jacobs fight is non-controversial for a change, as Alvarez’s last two fights at that venue were tainted due to the scoring of the fights being second guessed by fans and the media. This is the same location that Canelo’s two controversial fights against Gennady Golovkin took place. When the fans are unhappy at the scoring of fights, that tells you the judging needs to be improved. It’s bad news when the fans walk away angry at the way the judges scored a fight. Some boxing fans jokingly refer to the T-Mobile Arena as “The scene of the crime” due to how Canelo was involved in two decisions that went his way against Golovkin. Some fans were surprised when Canelo’s last fight against Rocky Fielding took place at Madison Square Garden in New York rather than the T-Mobile. These fans wondered why Canelo would want to mess up a situation by failing to fight in a venue where he’s viewed as being unbeatable when it comes to the judging. However, those same boxing fans pointed put that Canelo was facing a weak champion in Rocky Fielding, and the chances of the fight going to the cards were slim and none. With the recent history of what took place at the T-Mobile Arena in Canelo’s two fights against GGG, you have to wonder why they went back to that venue. It looks bad in the eyes of some boxing fans, who now think that Canelo purposefully chooses T-Mobile for his tough fights in order to make sure that he gets the win if it goes to the cards. In other words, these fans think Canelo is dependent on this venue for him to win fights that he otherwise might lose if the match had taken place at another venue where the scoring from the judges might go against him. “I want it so when people talk about T-Mobile Arena, they say that is where Canelo Alvarez fights,” Canelo said. This fight is seen as just a prelude to a much bigger match-up between Canelo, 28 and former IBF/IBO/WBA/WBC middleweight champion Gennady ‘GGG’ Golovkin (38-1-1, 34 KOs) on September 14. This is the fight that the boxing fans want to see, but Golden Boy Promotions haven’t said whether that fight will happen. Oscar De La Hoya said that he has a set price in his mind for what GGG is worth for a third fight with Canelo, and if he doesn’t like it, then they’re moving on. It sounds like De La Hoya isn’t as eager to make the third fight between Alvarez and Triple G as he was the second one. With the attitude that De La Hoya has abut the trilogy fight between Canelo and GGG, it might not happen. That would be bad news for DAZN, who signed Canelo to a huge money contract, and the only thing they have to show for it thus far is a mismatch between him and Rocky Fielding. That fight, if you want to call it that, was woefully bad. The U.S boxing public wasn’t excited about that match-up, and contest itself was horribly one-sided from star to the bitter finish. Fielding looked like random person, who had wondered into the ring looking for refreshments, only to find himself facing an angry bull in the form of Canelo. Fielding was wiped out in three non-competitive rounds. After it was over, it hard to believe that Fielding came into the fight the WBA ‘regular’ super middleweight champion, because he didn’t fight like a world champion. Hopefully the outcome of the fight is conclusive without controversy. Jacobs feels that he was on the receiving end of a questionable decision against Golovkin in 2017, when he lost a narrow 12 round unanimous decision. However, Jacobs was dropped in the 4th round. It’s easy to watch that fight and come to the conclusion that Jacobs lost. Matchroom promoter Eddie Hearn believes his fighter Jacobs is going to do the job on Canelo on May 4, and take his two middleweight titles from him. Hearn has believed that Jacobs is the best fighter in the 160 lb division since he first signed him to his Matchroom Boxing label a couple of years ago. With the help of Hearn, Jacobs has rebounded from his loss to GGG to win his last three fights against Luis Arias, Maciej Sulecki and Sergiy Derevyanchenko. Granted, Jacobs didn’t look good in any of those three fights, but he still won them, and that’s the most important part. Jacobs, 32, will be fighting on the highest level against Canelo, knowing that he needs the best performance of his life for him to get the decision or knockout. Jacobs obviously knows what he’s up against in fighting Canelo at his favorite venue at the T-Mobile Arena in Las Vegas, so you can count on him fighting tooth and nail for the entire fight so that he can keep the judges from taking the win away from him like what happened to Golovkin in his two fights with Canelo at that venue. “I believe that Daniel will unify the titles under the bright lights of Vegas and his remarkable story will have yet another incredible chapter,” Hearn said about Jacobs. Jacobs has been fighting well lately, but he’s going to have to figure out a way to keep Canelo from winning rounds by landing one or two hard shots, which is what he did to beat GGG. Canelo land many punches in his two fights with Golovkin, but the judges were impressed enough by those shots for them to ignore the jabs and power shots that Golovkin was landing. Jacobs needs to understand that he might not get the nod from the judges if his game plan is to box Canelo for a full 12 rounds. This fight might technically be called a unification match, but in reality, Jacobs has to be seen as the challenge facing the champion. As boxing fans well know, challengers have to do more than just beat the champions if they want to beat them and take their titles. They need to really give them a pounding for 12 rounds for them to win the fight. Jacobs is pretty smart. He knows what he’s up against in walking into the T-Mobile Arena to fight Canelo.